Helen Lois Countryman, age 87, got her angel wings on February 6, 2019 and all the angels in heaven were rejoicing. Helen loved her Lord Jesus and her family, and she lived a life of loving kindness toward all mankind. Helen may not have had a lot during her life on earth, but she always had plenty to share with others and share she did. Helen was a prayer warrior here on earth and prayer was one thing she did all the time. She was a member of Pleasant Grove Baptist Church and an active member until she because unable to attend. Helen Lois Young Countryman was born in Lufkin (Huntington) Texas on January 1, 1932 to Benjamin Franklin Young and Paralee Bennett Young. 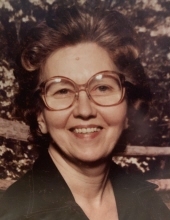 She is preceded in death by her parents, sisters, Verla Marie Young James and Hester Young Walker; husband, Jesse Jody Countryman; grandchildren, Jesse Jody Countryman, III., Eddie Sexton, and Willie Marie McMillan Campos; and great-granddaughter, Jessica Hodge. Survivors include her children, Jesse Jody Countryman and wife Phyllis, Frankie Lois Hodge, Jeanie Marie McMillan and husband Andrew, Terry Lee Countryman, Judy Fay Lamb and husband Louis, Larry Ray Countryman and wife Beth; along with twenty-one grandchildren, forty-seven great-grandchildren, thirteen great-great-grandchildren, numerous extended family and friends. Visitation will be held from 5:00 p.m. - 8:00 p.m., Saturday, February 9, 2019 at Pace Stancil Chapel, Cleveland, Texas. Services will be held at 2:00 p.m., Sunday, February 10, 2019 at Pace Stancil Chapel, Cleveland, Texas. Interment will follow at Pine Valley Cemetery, Pine Valley, Texas. Serving as pallbearers are Andrew (Andy) McMillan, Jody Lamb, Terry Lee Countryman, Jr., Frank (Bubba) Countryman, Jesse Louis Hodge, Jamie Lee Hodge, Garrett Countryman and Jerry Lynn Hodge. Serving as honorary pallbearers are Leonard Frank Countryman, William Ross Countryman, Louis Lamb, Jr, Bobby McMillan, and Allen McMillan. The family would like to extend a big thank you to Elizabeth (Beth) Countryman for her tender loving care of Helen during these last weeks along with the hospice nurses. To send flowers or a remembrance gift to the family of Helen Lois Countryman, please visit our Tribute Store. Interment will follow at Pine Valley Cemetery, Pine Valley, Texas. "Email Address" would like to share the life celebration of Helen Lois Countryman. Click on the "link" to go to share a favorite memory or leave a condolence message for the family.